Despite its heady valuation, the stock provides investors a series of tailwinds to cash in on and has all that it takes to re-rate further. Titan, a part of the Tata conglomerate, is among India’s leading home-grown jewellery companies. The company derives 80-85 percent of its annual revenue from sale of gold, diamond and studded jewellery. Watches and eyewear products are also a part of the company’s product portfolio. In Q1 FY19, the company witnessed healthy top-line traction across all its segments. Except for the eyewear segment, margin accretion was visible in all cases too because of operating leverage and lower spends on business associate meets. 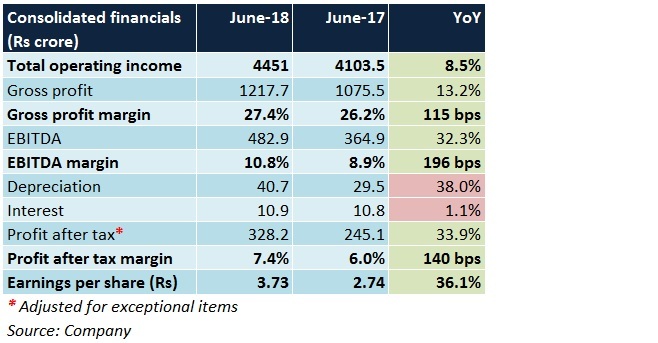 Revenue growth was subdued on account of weak consumer demand (barring Akshay Tritiya, no festivities), fall in gold imports and a high base of last year (GST implementation caused buyers to prepone purchases to Q1). Margins didn’t bear a significant brunt owing to an improved product mix, lower overhead spends and good inventory management practices. 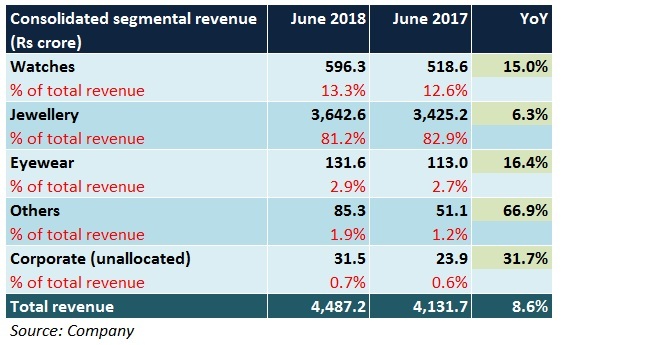 This segment was the standout performer with revenues growing on the back of growth in modern retail formats and higher primary sales to the trade channels. 11 World Of Titan, 7 Fastrack and 3 Helios stores were added in the quarter gone by. The strong sales momentum had a positive rub-off on the margins. Higher sale of sunglasses (more assortments made available at competitive price points) in a seasonally strong quarter (summer season) enabled this segment’s revenues to grow noticeably. However, additional investments in marketing led to a decline in margins. The revised gold exchange program continues to bring in new buyers to Titan’s jewellery outlets. This, coupled with the company’s existing ‘Golden Harvest’ scheme, will be pivotal to customer acquisitions. ‘Tanishq’, Titan’s flagship jewellery brand, will be decisive in boosting the company’s overall revenue. The management plans to increase add 30-40 new stores each year, primarily through the franchise-run route. While the former will augment the ‘Tanishq’ network (currently, 262 stores are spread across 173 cities pan-India), the latter will help keep the business model asset-light and generate higher asset turns. Impetus towards high-value studded and wedding jewellery variants will continue given their ability to fetch higher realisations and derive better margins. Continued focus on introducing new designs and extensive promotional campaigns is likely to draw customer interest, especially from the youth. Though brand/product/channel mix can vary from quarter to quarter, the aim is to ensure that margins are in the double-digit range by FY19 end. A controlled outflow of overheads will be crucial in this regard. The target is to achieve 26 percent year-on-year sales growth in FY19 and a customer tally of 3.6 million as against 2.3 million in FY18. Considering the stiff competitive intensity in this vertical, the proportion of lower-priced products could be higher. Titan’s fragrance business (brands - SKINN, Fine French, Skinn Kissed) is growing at a brisk pace, evident from the uptick in sale volumes in some major departmental chain stores in the country. Taneira, the company’s saree brand, has been receiving an encouraging response of late in the authentic ethnic wear category. This is largely because of trends such as repeat purchases and buyer referrals. Introduction of new products at periodic intervals (and brand building exercises) in the eyewear and watches segments should ensure adequate revenue visibility going forward. Nonetheless, in case of the former, Titan has had a hard time in breaking even. 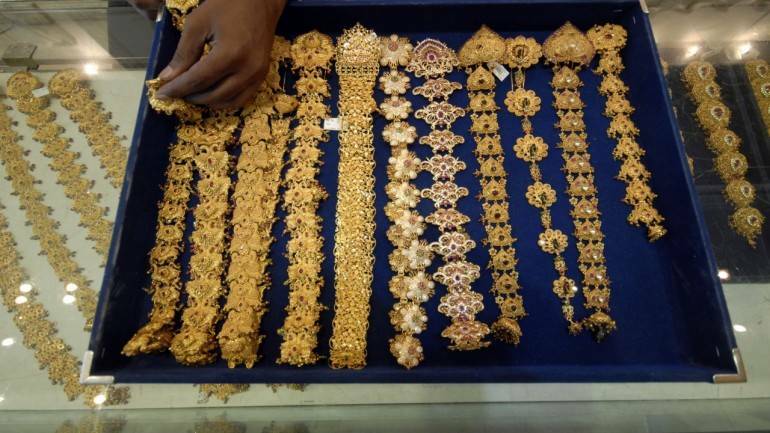 Moreover, risks associated with re-implementation of the Prevention of Money Laundering Act provisions and government’s close monitoring on the gold exchange schemes adopted by jewellers can dampen jewellery demand to quite an extent. With signs of market share gains (from unroganised and other branded players) visible and aggressive network augmentation on the cards, Titan’s management seems well-poised to achieve its objective of compounding its FY18 jewellery revenue (Rs 13,256.9 crore) by over 2.5 times in the next 5 years. The company’s prospects are bolstered by signs of improvement in the watches segment, which contributes 10-13 percent to the annual turnover. At 42.8 times FY20 projected earnings, the stock, despite its heady valuation, provides investors a series of tailwinds to cash in on and has all that it takes to re-rate further.